Pebble stone decks, also known as river rock coatings (often confused with pebble tec) are installed onto concrete surfaces and consist of natural pebbles mined from rivers world wide. With a wide assortment of colors and variations to choose from, creativity is endless. Carefree Stone transforms lackluster concrete surfaces into a beautiful, seamless pebble deck cover where puddles disappear. We install, maintain, repair, and remove pebble stone on concrete surfaces. ATTENTION: TEXAS RAINBOW 1/4 x 3/8 is NO LONGER AVAILABLE! What is river rock or pebble stone? Carefree Stone river rock is a unique, porous surfacing material designed for patios, pool decks, walkways, driveways, and all other outdoor areas. It is also used on indoor areas in stores, lobbies, restaurants, banks, and offices. 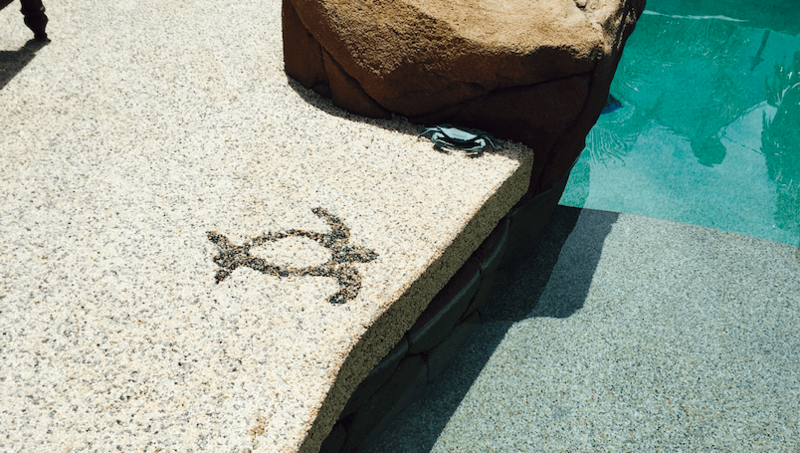 River rock is commonly referred to as pebbletec and, yes, many of our pebble stone choices are the exact stones used for pebbletec surfaces inside pools, but we specialize in surfaces OUTSIDE the pool. What holds the stones in place? Each individual pebble stone is coated with an “invisible shield” of high-grade bonding epoxy. This epoxy bonds each pebble stone together and bonds all the stones to the sub-surface below to form a solid, locked-in-place surface that adds a layer to the concrete. No. Carefree Stone river rock is composed entirely of the world’s most beautiful natural stones, pebbles, sea shells, or marble chips. The pebble stones themselves are completely natural, created by Nature itself. Can I drive a car on a pebble stone driveway? How long will my pebble tec deck hold up? Carefree Stone pebble stone requires maintenance (a thorough pressure-washing as well as a fresh new coat of epoxy) every 2-4 years to maintain durability, preserve its appearance, and enhance the life considerably. This is an important process that will ensure the river rock stays bound to the concrete and holds up for life! Why are pebble stone decking porous? Designed to eliminate puddles, each pebble stone has a thin coating of high-grade epoxy, but there is space between the stones. So, just as water drains through a pebble surface or a sand surface, water drains right through Carefree Stone almost instantly! Unlike terrazzo, marble, flagstone, or other surfaces that become a slippery menace when wet, Carefree Stone river rock is porous (usually never any water lying on the surface) and, therefore, people are less likely to slip. Is pebble stone hot on bare feet? Because river rock is porous, it is actually cooler on bare feet than the concrete that we apply it to! Many of our customers are happy they chose river rock for their pool decks, for example. No. Our pebble stones are small polished stones. While some options are jagged, most are totally rounded. Either way, these stones are polished and soft and include no sharp, dangerous protrusions. Can pebble stone be installed onto my cracked concrete? Yes! Carefree Stone river rock is often installed directly onto cracked and uneven concrete. Not only does this fix your concrete blemishes, but it adds character to your boring concrete slab.